When you played outside as a little kid, you didn’t care if you came back covered in mud or soaking wet. Growing up made us care a bit more, but only because we have to do our own laundry, buy new shoes if we destroy them by stepping in a creek or running while it’s raining, and having prune feet is the worst. If you know that you are going to be outside a lot with too many chances for stepping in water, then you’ll want to protect your feet from getting soaked. While fast-drying shoes are a must, these Dexshell Waterproof Socks would be pretty useful as well. They’re light, comfortable, and perfect for biking, running, or walking the dog. These would also help you out when it’s warm and you need to keep your feet dry from sweat. These are made up of 96% nylon, 3% elastane, and 1% cuff elastics on the outside, and 80% cotton with 20% nylon on the inside. 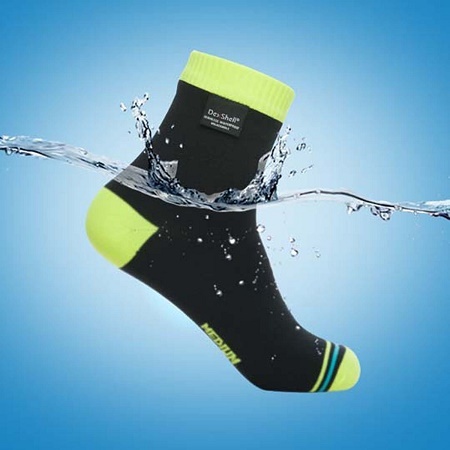 This composition makes for waterproof, breathable socks that should help you out whether you’ve stepped in a puddle or are out in a rainstorm. There are sizes from small to extra large, and they vary in price from $26-30. There are options for high-visibility orange and yellow, and while these are just ankle socks, there are taller versions for those who need more protection past their feet. Prune ankle isn’t a thing, but that doesn’t mean you shouldn’t guard against it too. The Hydra Cup Dual Shaker – why bring two shakers when you only need one?